Would you consider yourselves part of the PC master race? Yes, certainly. I like to own a machine that is more powerfull than consoles and that I can enable 8xMSAA if I want. I also like the fact that PC have free emuletors, mods, etc.. But in the end, I spend much more time on my consoles. Why? Because consoles are easy to setup, switch on rapidly on my big living room screen, because of local multiplayer and exlusive games (Smash), because my couch is awesome... I don't need 1080p60FPS to enjoy playing games. piccolo289 Wrote: Not the PC elitist race, the Master race. 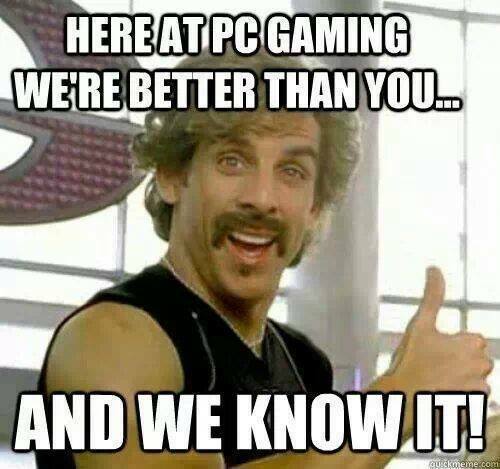 I guess PC elitists are those fu**ers who thinks that PC is the only good way to play. It depends on what your priorities are in spending your money...A pc is not like a car or a house to be unapproachable by most people to have a decent one. (11-22-2015, 10:23 PM)DrHouse64 Wrote: I guess PC elitists are those fu**ers who thinks that PC is the only good way to play. More seriously DrHouse64 I loved your posts . LordVader : didn't know you're french too, bro-fist !